Gravenstein is an attractive high-quality dessert and culinary apple, first described in 1797. It is well-known in the USA and northern Europe, and is still grown commercially on a small-scale. Gravenstein is a triploid variety and as is often the case with such varieties, produces a large vigourous tree with dark thick leaves. 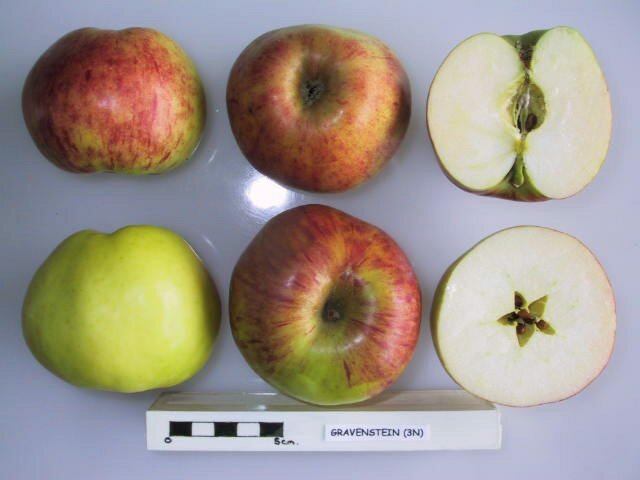 Possibly because of its triploid nature Gravenstein seems to have a greater degree of variability than most varieties. There is also a red "sport" known as Red Gravenstein, where the red coloration is more pronounced (and we think less interesting). Gravenstein is a relatively hardy variety and can withstand difficult conditions - by European standards. In North America where summers are often hotter and winters much colder, it has a reputation for being fussy, and undoubtedly does best in areas where the climate is closer to the milder winters and cooler summers of northern Europe. The real problem with Gravenstein is that it is prone to many diseases and therefore has never achieved the popularity it deserves. As so often in the world of apples, it seems that the apples with the best flavor are often the most difficult to grow. Not surprisingly for such an old variety, the origins are uncertain. It is most closely associated with Denmark, and although widely known as "Gravenstein" in English-speaking countries, an alternative name is "Graasten" since it is thought the mother tree was raised at Graasten Castle in southern Jutland, Denmark. In his 1940 book "Denmarks Fruit Varieties" (Danmarks Frugtsorter) Danish pomologist Anton Pedersen gave Gravenstein 3 stars for eating quality, a score equalled by only one other variety - Signe Tillisch. Gravenstein was declared the "national apple" of Denmark in 2005. We have Gravs all over the place here and they are nice early apples. I like them best for baking, but have made hard cider as well. They do not transport well and have a quick shelf life. Nice and sweet but a bit mealy, which makes for great pies or my new favorite Gravenstein Upside Down Cake. I live in KY and grew up with Gravensteins in the PNW would the grow in central KY.
Gravenstein: THE BEST APPLE IN THE WORLD FOR APPLESAUCE! So smooooth, with just the right amount of tartness and flavor. Cook until soft in just enough water to keep the apples at the bottom from burning, run through a conical colander or food mill, then sweeten with sugar and add cinnamon...YUM! Stores a long time in the freezer (even years!) if it stays hidden from my family for long enough! I especially like it to be on the thin side, so I just add a little more water. Very few things can be called "the BEST," this is one of them. Hard to find the apples here, so I planted my own tree. This is the best apple there ever was. I only wish I could find them in Ontario. I have a Gravenstein Apple Tree in my backyard that my mother planted about 38 years ago. it was never pruned and it's huge. it's about oh I don't know forty feet high and the apples are absolutely delicious. there has been a couple years we've actually gotten two different seasons off of it. they do come early and they're huge and beautiful. they make applesauce that you don't have to add sugar or spices to if you don't want to. we had a cider press and made cider that tasted like apple lemonade it was delicious. I have some fun pictures. Gravenstein is my favorite early-season pie apple. As it's juicier than other pie apples, I use extra thickeners (flour and cornstarch). It requires only a little spice (nutmeg and cinnamon) to make a delicious pie; I'd advise pie-bakers to take care not to overwhelm the Gravenstein's nice flavor with spices. This is the first apple of the season around here, at least that I want to eat. The taste is simple, probably best described as being "clean", which is probably just another way of saying "balanced" without many other flavors. A nice refreshing crunch, too. I like it enough to have planted one. The red sport of this variety grows pretty well up here in cold New England-the man at the farmer's market said this year was a red banner year for it, and after tasting them, I agree wholeheartedly. Lots of juice, and when I cooked it into applesauce, I thought it was going to be too sweet-it was lovely! Been using the apple as part of a plan to wean me off sweets, but tastes better than any crud the stores have. I have some Gravenstein apples on a branch of a tree which the Gravensteins share with Golden Delicious, Spartan and Granny Smiths. I've just eaten the last two Gravensteins, and the flavour was quite exceptional. They didn't produce such a big crop this year, but they made up for the small quantity with the taste. I'm located on Vancouver Island, where they seem to do well. Luther Burbank said this was basically the ultimate apple. Very sweet, crisp, and delicious, with an unmistakable flavor. Unfortunately, these apples can't be stored for any length of time. But, on the bright side, that means that when you do find them at the market, they are still reasonably fresh. Another fan of the local Gravs--love the flavor cooked or fresh, but perhaps my favorite thing about this variety is the intense aroma! One apple in the fruit bowl can infuse the entire room with a mouthwatering aroma. Also the Sebastopol Gravenstein fair in late summer is great fun, especially with kids. The earliest fruiting tree I have in my orchard. Bears late July, usually. Early August this year (2013) due to late blossoming. Terrible keeper (1-2 weeks), but makes the best applesauce, bar none. Anyone I give the apples to raves about the applesauce. Don't try to eat the applesauce w/o sugar, way too tart. Just add enough sugar until the sour taste goes away and you will have the best applesauce ever. I can't say much about this apple. It only bloomed one measly year for me and produced an apple or two. I think I'm going to get rid of it. I just tried my first Gravenstein after a recommendation from a local Oregon grower. I love tart apples and usually keep Granny Smiths or McIntoshes around the house depending on the season. I'm so glad to have happened upon the Gravenstein; I'm only sad that they don't keep a little longer. I really enjoyed this variety as an eating apple—not too sweet—although the flesh is just a little bit softer than I prefer. I also made a lovely sour cream coffee cake with caramelized Gravensteins as a topping. I'm not a great fan of cooked fruits but I will be adding cooked Gravensteins to my regular repertoire and plan to stock up and make my own applesauce. This apple will definitely be added to my list of favorites. We have a tree on our small property that has been providing the most tastey apples for 15 years now. A friend told me she thought it was a Gravenstein. It fits all descriptions here! Most interesting is that it has something wrong with it that the tree is living on about 1/3 of its trunk-the other 2/3 has been eaten away by disease and/or termites(???). BUT it has continued to produce the most beautiful and delicious apples even though the trunk has been like this for at least 8 years! We love our little tree, it is such a blessing! I have a 50 year old Gravenstein apple tree in our backyard (which used to be my grandparents house). It is still producing (lots this year) but I can tell it is getting old and would like to buy another one. I think they are by far the best all round apple . For the past several years I have been dehydrating them with no sugar added and they are the best!!!! I am a grower here in Sebastopol. There are very few of us left. Some of my trees were planted in 1887. Of the original 10 acres, about ten trees remain. They have not had a lick of care since the 1950's and are still producing mostly disease and pest free apples, (albeit some rust.) I am not listed in the 'Where to Buy' section, but would like it to be known that I WILL SHIP ANYWHERE IN THE US! Contact me in July and we can make arrangements. A large robust old Gravenstein tree-- planted in the mid 1910s-- in a seriously neglected orchard that I'm restoring has continued to surprise. It is more resistant to scab and canker (and drastic restoration pruning) than contemporary trees of other varieties here, despite its reputation for susceptibility. It continues to fruit despite no longer having other nearby cultivars that flower as early because its flowers last for weeks! And it has this year yielded over 6 bushels of apples, over a period of 8 weeks (early Sep-early Nov; notable even in our mild coastal climate). It's a great household apple because the crop ripens in small batches over so long a period, so there is never a glut (although windfall apples bruise easily and seem to be especially favoured by slugs). I don't feel it's the best eater-- although tasty enough-- but it makes terrific apple sauce/stewed apples and is good in pies too (best mixed with other cookers?). I understand it is also great in blended juice-- plan to test this next year. One summer while living in Altadena, CA, my mother and I went to Albertson's grocery store in Sierra Madre, CA which displayed gravenstein apples. Never having tasted them, I asked the produce man about them. I learned that they were a very good cooking apple and great for apple pies. Since my husband loved apple pies and it was summer, I thought I'd try them. They made wonderful pies, and I was hooked! Then I found gravenstein sweetened applesauce in Von's grocery store. Now, none are available, and I'm drowning in sorrow! (I did find a jar of unsweeted gravenstein applesauce at Trader Joe's, but I much prefer the sweetened kind.) I read On-Line that Safeway has gravenstein applesauce, but I haven't been to the one Safeway in Las Vegas to verify if this is true as it's quite a distance from my home. All I can say is, I did plant a gravenstein tree in my yard, but it's too soon to tell if it's going to survive. It's the prince of all apples. I am looking for another gravenstein tree but am having a difficult time locating one at several nurseries. I won't give up because gravenstein apples are so choice! I grew up on Vancouver Island (s. coast, B. C.) with a mature Gravenstein apple tree as our #1 producer in our 3 tree orchard. It never seemed to have any problems - despite notes here about susceptibility to various ailments - and always bore a massive crop of apples. We thinned out the green apples and collected the windfalls for the best pies and applesauce ever. The ripe apples kept in our coldroom till around December; it was always something of a race to use the last of them up, but even past their best for eating, they were still a good cooking apple. Our tree's fruit tended to be large and yellow with a red blush on 1/4 to 1/2 the apple, and as the fruit matured it developed a distinctive, waxy coating on the skin. The apples were at their very best for eating just as that waxy coating formed. I've been totally spoiled for any commercial varieties ever since. Oddly enough, the only one that ever came close were the first Braeburns from New Zealand. However, when you can find it at all, that variety has changed and isn't as good anymore. I also love Gravenstein apples and would like to grow some. I first experienced eating them in Denmark. We have an ancient 1900's apple orchard on our farm (been in family since 1862 when homesteaded). Some strange apples trees left including Two Gravensteins, one of which fell over 10 years ago but still produces fruit (Horizontally). Absolutely the best eating apple I have ever had! Everyone that tries apples from these trees asks "What kind of apple is this?....never tasted anything as good!". Gotta eat them off the tree at the right time. Too bad they don't keep! WE LOVE GRAVENSTEINS! I have only four grocers to choose from in my community. (Nary a Grav to be found) I miss the many green grocers in my old neighbourhood in East Vancouver, BC where a good sized Gravenstein would be my lunch. I would almost have them shipped from BC. Our local Slow Food chapter has worked for 6 years on preserving the Sebastopol Gravenstein. Now the apple has been placed on the Art of Taste with the Slow Food International Foundation for Biodiversity. One can buy Gravs from some of our rare fruit growers in the area: http://www.crfg.org/. For more info on saving the Gravensteins and where to buy them fresh, go to http://www.slowfoodrr.org/localprojects.html. Just moved back to Vancouver Island in Dec. I'm told that the three apple trees in the backyard are Gravensteins, so I'm eagerly anticipating harvest in October. My parents had a Gravenstein apple tree that produced for well over 30 years. It was the only apple we ever used to make apple pies -- they were the Best! Sadly, it became diseased and died and I have not been able to find a local source to replace it. I sure miss those pies! I'm originally from Holland also. I'm really upset because the local Pavilions stopped carrying my favorite Gravenstein applesauce which I've been buying there for 20 years. The thing is I never checked if it was S&W or another firm. Please don' tell me they've gone out of business. I don't want the other brands; they don't have that fresh, clean, not overly sweet taste. Trader Joe has the unsweetened, but I liked the regular one. Anyone know who in the southland still carries it? I would put the hawaii apple (starks bros) on top 10 for taste. The apple is good for eating and cooking -pies, dessert. It's not a great keeper. I also like winesap. "Curiously a friend in Burnie, Tasmania (a fine climate for apples) related to me that her Gravenstein didn't fruit at all in the summer of 2006 but threw a bumper crop in the summer of 2007." Actually (at least in the USA) this is a common behavior of apple trees when they are left to their own devices. One of the purposes of pruning is to suppress the trees' natural inclination to this fruiting behavior. I am not an apple eater but I go crazy for the Gravenstein which in the Australian summers is past its prime almost as soon as it's off the tree. Curiously a friend in Burnie, Tasmania (a fine climate for apples) related to me that her Gravenstein didn't fruit at all in the summer of 2006 but threw a bumper crop in the summer of 2007. If you're after Gravensteins in Victoria, head for the high country in the state's north-east where you can be lucky to find them for sale by the side of the road! Gravensteins are the best thing about late August in Nova Scotia's Annapolis Valley, my former home. I like sour and crunchy types. They do age quickly, so are best enjoyed as close to picking as possible. Unfortunately they are difficult to come by out here in B.C., my new address. My grandparents grew up in the Sebastopol area. Every year they would travel up there from the bay area and bring home flats of Gravs. My grandmother made pies and applesauce. I have a tree in my backyard and every year my family can't wait for my Grav apple pie and applesauce. They are a special apple! We have a lovely Gravenstein in our backyard that is overflowing with the yummiest apples ever. Deer go crazy over the fallen apples. I dry some in a food dehydrator and they make great snacks all year round. I think the Gravenstein Apple Fair is going on in Sebastopool this weekend and we may drive up to check it out. My family's last name is as well Gravenstein (wrote Gravesteijn here). This family name can be found back till 1680 in Holland. There are a lot more family's in holland called Gravesteijn. About the apple, I know that it exists but never found it. Is it true that there is a city called Gravenstein in the USA?? Maybe there is a link between these family's? Gravenstein is my family's last name. You can find Gravenstein Apple products in Sebastopol, California, USA. We found a group of wild growing Gravenstein apples in Adams Cty Wi. They are wonderful tasting apple and an interesting texture. No doubt the best apple on the world, I grew up in Denmark eating at least one apple a day, Gravenstein was the favorite, I am now living in Georgia, I haven't been able to find Gravenstein here in the south, HELP, I can find the Gravenstein applesauce but not the apple, Imagine my surprise when I read Gravenstein is called Graasten in Denmark, I have never heard that name before, I was borne in Copenhagen 1934 and have lived in USA since 1958.